Built in black and very, very dark grey, Haeundaddy, whose Kaneda’s bike from Akira we featured a couple days ago, has created a version of the UCS Batpod that will definitely please the Dark Knight. 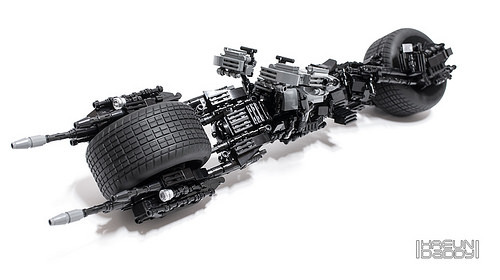 The Batpod is Batman’s escape vehicle integrated into the Tumbler — highly manoeuvrable, but leaves Batman somewhat exposed without the Tumbler’s armour. Haeundaddy has included the important weaponry with dual front-mounted cannons, machine guns and grappling hooks. The Batpod is all about manoeuvrability so check out that steering mechanism, apparently all under the control of Batman’s broad shoulders. That’s real power steering!